In the age of disruption, a culture of growth mindset and collaborative learning will help us with innovation, transformation and business performance while managing our well-being. This culture can be built by Growth Leaders who have awareness of self and others, ability to expand perspectives and increase the empathy levels in self and in others. We make this possible for companies by developing leaders to become Growth Leaders using the Growthbeans Framework and the Growthbeans WayTM. 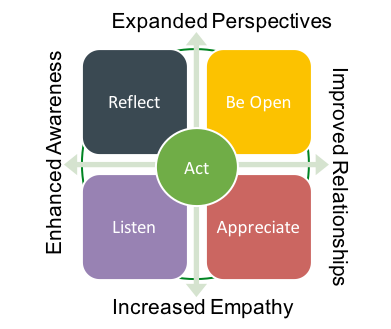 ** All circles are safe spaces – ideal environment for practice & growth. We believe every individual is like a seed. Under the right conditions, it will grow to become a healthy plant that contributes to the larger ecosystem. We are passionate about partnering with organizations to provide the right conditions to enable the growth of their employees for their business growth.